The Boomerang Bro (or Boomerang Brother) is a type of Koopa Troopa that, like Hammer Bros., specialize in the use of a certain item as a weapon. Instead of throwing Hammers like the Hammer Bros., Boomerang Bros. use Boomerangs that move back and forth to them. They are not as commonly found in the Mario series as their Hammer Brother relatives. The physical appearance of Boomerang Bros. has changed throughout the series. Early artwork depicts them identically to Hammer Bros. of that era, with orange skin, along with black shells and helmets. The Boomerang Bros. in Paper Mario: The Thousand-Year Door and Super Paper Mario appear to be based on this coloration. In Super Mario Bros. 3 and its remakes, they have green skin and striped underbellies. Mario Superstar Baseball started the trend of depicting Boomerang Bros. with yellow skin and blue shells and helmets. Most games since have retained this depiction. Boomerang Bro sprites, from Super Mario Bros. 3. Boomerang Bros. debut in Super Mario Bros. 3 as somewhat common enemies found primarily in Desert Land. They attack Mario or Luigi by throwing multiple boomerangs which circle back if they missed. In order to defeat a Boomerang Bro, Mario or Luigi need to jump on them or throw something at it, such as a Fireball or Shell. If one of the brothers can get close enough, the creature can also be defeated by Raccoon Mario's tail. Their map icon in the NES version was originally a Hammer Bro. This was changed in the SNES version to reflect a Boomerang Bro. This change stayed in the GBA remake. Every Treasure Ship is guarded by a pair of Boomerang Bros. Also, in Dark Land, a Boomerang Bro appears as the boss of the first tank level. In the NES version, these ones appear a sky blue color, due to the space in the data most commonly occupied by green palettes being replaced by a sky blue palette in artillery levels. In New Super Mario Bros., Boomerang Bros. appear as rare enemies, although they are one of the most common species of Hammer Bros. in the game. Only one appears in World 2-5, two appear in World 7-3, and two appear in World 8-7. Boomerang Bros. will, once again, attack Mario or Luigi by throwing boomerangs at them. Boomerang Bros. return in New Super Mario Bros. Wii, acting and appearing in much the same way as in the previous game. However, they are extremely rare, with only two of them appearing in World 2-1. Boomerang Bros. make their first 3D Mario appearance in Super Mario Galaxy 2. They first appear at Bowser Jr.'s Boom Bunker, and like the Hammer Bros., mostly appear in Bowser and Bowser Jr. galaxies. Three of them also appear at the end of the Grandmaster Galaxy, where they have to be defeated to get the Power Star in the first mission and the final Launch Star in the second mission. As usual, Boomerang Bros. use boomerangs to attack the player. If one is defeated while its boomerang is out, the boomerang will still turn around and fly back towards the area from which it was thrown until it hits a wall. Yoshi can catch the boomerangs with his tongue, and then spit them out as weapons against the Boomerang Bros. The player can flip them over by using Yoshi's tongue, by jumping on them or via spinning, and then walk into them to defeat them. It is possible to avoid boomerangs by crouching, and since Mario can walk while crouching, this makes it very easy to approach and defeat a Boomerang Bro. Boomerang Bros. reappear in Super Mario 3D Land and retain their behavior from Super Mario Galaxy 2, though they are beaten in one hit. From World 5 onwards, Boomerang Bros. can drop Boomerang Flowers when defeated. They mostly appear in castle levels in the normal worlds, and in a variety of levels in the special worlds. The Boomerang Bros. return again in New Super Mario Bros. 2, operating in the same manner as before. Unlike the other Hammer Brother members that are in this game, the Boomerang Bro appears in five different levels, which are World 2-2, World 2-5, World Mushroom - , the second course of the Platform Panic Pack, and the first course of the Mystery Adventures Pack. In the latter, it is shown that they can be placed under the effects of a Gold Ring; when this happens, they toss three coins instead of their normal weapons, like the other Hammer Brother species. Boomerang Bros. return once more in New Super Mario Bros. U where they act in the same way as in the predecessors. Five of them can be found in the level Bouncy Cloud Boomerangs from Meringue Clouds. Boomerang Bros. appear in Super Mario 3D World once again, working as they did in Super Mario 3D Land. They appear primarily in Beep Block Sky Plaza, Fire Bros. Hideout #3, and Bowser's Lava Lake Keep. In the short anime film Super Mario Momotarō, a Boomerang Bro becomes the second creature to join forces with Mario on his mission to rescue Princess Peach after helping it get up from being stuck on its back. During the battle with Bowser, the Boomerang Bro helps by hitting him on the head with its boomerang, as well as knocking out Iggy Koopa with it. After the battle, the Boomerang Bro helps Mario deliver the treasures Bowser stole back to their rightful owners. He could represent the dog from Momotarō. 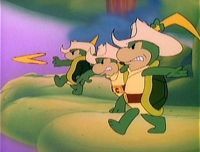 Boomerang-wielding Koopa Troopas from the episode "Crocodile Mario" in The Super Mario Bros. Super Show! While technically not Boomerang Bros., The Super Mario Bros. Super Show! episode "Crocodile Mario" features standard Koopa Troopas that attacked using Boomerangs. Two Boomerang Brothers from the The Adventures of Super Mario Bros. 3 episode, "A Toadally Magical Adventure"
Boomerang Brothers appear several times in The Adventures of Super Mario Bros. 3, serving as soldiers in Bowser's army. Through the use of their boomerangs, these are used in long range attacks. Unlike in the game, it is not uncommon for Boomerang Brothers to travel together in groups. A Boomerang Brother made a relatively minor appearance in the Nintendo Comics System story The Kingdom Enquirer, where it attacks Mario and Toad with its boomerangs after the two heroes exit a Warp Pipe. If Mario chooses to follow the main path to Fort Koopa in the Koopahari Desert in Double Trouble, he encounters the Boomerang Brothers (described as monstrous twins, despite the illustrated activity depicting four), who send a barrage of boomerangs at him after deciding the plumber looks tasty. Depending on how the accompanying puzzle is solved, Mario escapes either narrowly or easily and reaches Fort Koopa, or is hit in the back of the head by a returning boomerang while taunting them. This leads to one of the book's few Game Overs - one of them nonchalantly picks the knocked out Mario up by the leg, tosses him into a sack of old orange peels and other things he has picked up in his travels and, upon sheepishly agreeing with his brother that they're tired, plans to go home to make themselves "a nice pot of plumber soup." In Yoshi's Safari, Boomerang Brothers occasionally appear as mini-bosses that attack Mario and Yoshi by throwing boomerangs at them. These Boomerang Brothers are difficult adversaries to defeat, as they possess a large amount of health and run back and forth quite quickly. Unlike other experiences with Boomerang Brothers, Mario can knock away an incoming boomerang by blasting them with his Super Scope. A different kind of Boomerang Bro appeared in Mario & Luigi: Superstar Saga. These Boomerang Bros., however, were rather tall and thin, wore sunglasses, and had sprouts growing from their heads. In the remake, these are renamed "Beanerang Bros.," with regular Boomerang Bros. now appearing in the new Minion Quest: The Search for Bowser story. In Minion Quest, Boomerang Bros. are ranged troopers, and attack by throwing their boomerangs at enemies. Their special skill, Piercing Projectile, allows them to throw a boomerang at a targeted enemy, damaging any enemy other enemy in its path, along with hitting the targeted enemy a second time as it flies back. Boomerang Bros. are strong against Pokeys and Goomba Towers. Boomerang Bros. return as an enemy in Mario & Luigi: Dream Team. In the field, they chase Mario and Luigi very briefly when spotted, and then throw their boomerang at them. Like with the Beehoss' bees, touching the boomerang engages a battle with the owner of the touched boomerang. In battle, Boomerang Bros. follow the orders of the Commander Lakitu in the background. A Boomerang Bro will approach the Bros., look at the Lakitus (in one instance) fly in a varying kind of circle and throw their boomerangs in a similar fashion to how the two Lakitus fly. Mario and Luigi must both at one point jump on (or over for the boomerang to hit the Boomerang Bro when coming back and damage it) the boomerang to avoid it. If the Commander Lakitus are defeated through use of a Taunt Ball, the Boomerang Bros.' own actions give away their attacks. If there are two or more Boomerang Bros., the two Lakitu may raise a red M flag and green L flag, one raising one and the other raising the other. As they do this, the Lakitus move towards or away from the battle simultaneously. The Boomerang Bros. will throw their boomerangs in the air also simultaneously, for them to land on one bro each one after the other. Mario and Luigi must hammer these back to sender before they hit them. Whichever Bro's flag is being held by the Lakitus who's closer is the Bro who must smack their incoming boomerang away first. Additionally, the boomerang that will hit its target bro first also moves towards its target faster than the other, as indicated by the shadows on the ground. This takes up the attack turn of the Boomerang Bros. involved. If they fly in a clockwise (when looking from the Bros.' point of view) circle, the boomerang will fly towards Luigi first. If anti-clockwise, it will fly towards Mario first. If the Commander Lakitus floats downwards and does two clockwise loops, the Boomerang Bro will jump then throw (this being another indicator of a jump throw), and the boomerang will fly towards Luigi first, however it flies the Bros. heads for the first loop, where they must idle, and then jump when it flies towards Luigi the second time. If it does this with anti-clockwise loops, it will fly towards Mario first, and he must jump first on the second loop. Boomerang Bros reappear in Mario & Luigi: Paper Jam as enemies, along with their paper counterparts. They appear in Bowser's Castle and one room in Neo Bowser Castle. In battle, they have two attacks. Their first attack is by walking in front of one bro and throwing their boomerang, which must be jumped over, then the boomerang will fly back behind a different bro which again must be jumped over. If the boomerang is jumped on the first time, the second attack will be nullified. If the boomerang is jumped on the second time, the Boomerang Bro will take damage; the opposite as in Mario & Luigi: Dream Team. Their second attack is for their boomerang to circle around one bro, which must be hit back with the hammer. If the boomerang is not hit in enough time, the bro will take damage. Boomerang Bros. appear in Mario & Luigi: Bowser's Inside Story + Bowser Jr.'s Journey as enemies and recruitable allies in the Bowser Jr.'s Journey mode. They are strong against Pokeys, Goomba Towers and Toothies, but are weak against Parabones. A single Boomerang Bro named Bamma appears in Paper Mario: The Thousand-Year Door as a competitor in the Glitz Pit alongside the Hammer Bro Hamma Jamma and the Fire Bro Flare. He sports a silver shell and helmet, and his boomerang bears a single red stripe. Similar to the Boomerang Bros. in Super Mario Bros. 3, Bamma can attack Mario and his partners by either throwing a single boomerang or multiple ones by using either his Boomerang Throw or Multiboomerang moves, respectively. In Super Paper Mario, several Boomerang Bros. are brainwashed by Nastasia to serve under Count Bleck. The game also features a new, shadowed type of Boomerang Bro known as a Dark Boomerang Bro. Boomerang Bros. reappear in Paper Mario: Sticker Star. Unlike previous Paper Mario games, their helmets and shells are now the standard blue, and as with most returning enemies appearing in the more standard Mario platform games, they with other Bros. enemies they have gotten a visual revamp. Boomerang Bros. appear in numerous areas, starting from World 3. They are mostly found in outdoor areas. Outside of battle, they can attack Mario by tossing a Boomerang at him, which damages him. Their main attack is throwing a boomerang at Mario that causes damage twice, during the initial throw and when it returns. Their Boomerangs also sometimes spread a curse on Mario preventing some of his attacks to be successful as well as keeping him from using evasive stickers. Since their defense is 2, Boomerang Bros. are immune to Hopslipper stickers. Sometimes after battle, a Boomerang Bro may drop a Boomerang sticker. A couple of Boomerang Bros. stop and ambush Mario to prevent him from getting the Comet Piece. These same Boomerang Bros. (after defeating Gooper Blooper) guard a Heart Block and an HP-Up Heart. However, instead of fighting together, they are fought individually. The two Boomerang Bros this time are assisted by two Ninjis (one in each battle) and one Snifit. Boomerang Bros. return in Paper Mario: Color Splash keeping their appearance and behavior from the previous game. They are only found in Sunset Express, Green Energy Plant and Black Bowser's Castle. A circus version of them called Circus Bro appears in Mossrock Theater and during the battle with Lemmy in The Emerald Circus. In Mario Superstar Baseball, one of the alternate color schemes for the game's playable Hammer Bro is a Boomerang Bro that wields a large boomerang in place of a baseball bat in the same way that Hammer Bro wields a hammer instead of a bat. Boomerang Bro is a power-type player in the game, and can easily obtain home runs. Beginning with this game and beyond (excluding Super Paper Mario), Boomerang Brothers wear a blue helmet and a blue shell, similar to blue-shelled Koopa Troopas. Boomerang Bro is also a playable character in Mario Super Sluggers. However, unlike in Mario Superstar Baseball, he has average pitching and fielding abilities, and his batting is tied with the Hammer Bro, while inferior to the Fire Bro. In Mario Golf: World Tour, one of the names that can appear on the tournament scoreboard is "Boomerang Bro". Boomerang Bros. appear in Mario Kart 8 and its enhanced Nintendo Switch port Mario Kart 8 Deluxe on the courses Bowser's Castle and 3DS Neo Bowser City as spectators. One of the sponsors in the game is Boomerang Bros. International Airlines, which appears to be run by Boomerang Bros.
Boomerang Bros are virtually identical to Hammer Bros in appearance, featuring the same colored skin, belly plate, nose, and eyes, though with differences, such as wearing dark blue helmets, shoes, and shells. In comparison to Hammer Bros, Boomerang Bros have maintained consistent designs more often. Official artwork of Super Mario Bros. 3 depicted Boomerang Bro with somewhat darker yellow skin than in recent games, while his shoes, shell, and helmet are black. 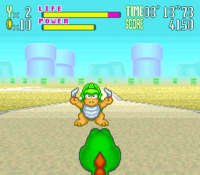 In-game however, Boomerang Bros are depicted with light green skin and white belly plates, instead, likely due to the NES's technical limitations; however, all other aspects of their design are faithful to their artwork. Boomerang Bros' sprites in Super Mario All-Stars and Super Mario Advance 4: Super Mario Bros. 3 depict them with darker green skin, as well as tanned belly plates. Paper Mario: The Thousand-Year Door gave Boomerang Bros altered designs, with them having rounder body proportions, wearing spiked armbands, and sporting black helmets, shells, and shoes, similar to Super Mario Bros. 3. From Paper Mario: Sticker Star onwards, they use their current designs, but with paper outlines around them. Early on in their history, Boomerang Bros didn't have voice acting, due to technical limitations of the NES and SNES. In some games, like Paper Mario: The Thousand-Year Door, Boomerang Bros are given text dialogue, so players can understand what they are saying. As of Super Mario Galaxy 2, they have received voice acting from Motoki Takagi, who also voices Hammer Bro and Fire Bro. When voiced, Boomerang Bro's speech primarily consists of grunts and yells, but sometimes includes exclamations like "NO!. Card Description This elite Koopa goes bananas for boomerangs. Unfortunately, they hurt when you try to eat them. Quotes Usual: "BOOM! ERANG!" ~ "How's my boomerang taste?" ~ "You 'rang?" ~ "'RANGZZZ!" Minion Quest: The Search for Bowser bio: They throw boomerangs with ample gusto. Strong against Pokeys and Goomba Towers. Bowser Jr.'s Journey bio: They throw boomerangs with ample gusto. Their specialty is to attack the bellies of tall enemies like Pokeys. For this subject's image gallery, see Gallery:Boomerang Bro. Italian Boomerang Bro. Boomerang Bro. This page was last edited on April 22, 2019, at 21:24.